Cape Town - Former Bafana Bafana head coach Gordon Igesund says Stuart Baxter should be entrusted with the job until 2022. South Africa has gone through four coaches in the past seven years. Pitso Mosimane’s two-year stint came to an abrupt end in 2012 with Steve Komphela serving as mentor for a short while under an interim basis. The experienced Igesund was then brought into the fold to bring back the glory days but the South African Football Association (SAFA) was not having it as they brought in Shakes Mashaba for a fourth tenure. 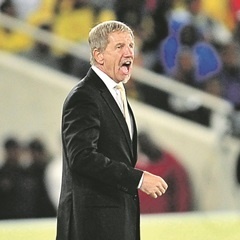 Baxter, now in his second tenure as mentor, failed to guide South Africa to next year’s 2018 Soccer World Cup after a dismal qualifying campaign. The usual procedure for SAFA is to sack a coach but Igesund is against the idea of cutting yet another coach’s term short. “In my opinion Shakes Mashaba was doing a good job‚ and then for whatever reason he was dismissed‚ and then someone again came in halfway through‚” Igesund said as quoted by the TimesLIVE website. “It takes players time to change from my philosophy to Shakes’‚ and to Stuart’s. There’s no continuity. And in my humble opinion‚ give the job to Stuart until 2022. “Let him have the start of the World Cup qualification‚ start off preparing his team‚ let the players get used to him over the next year‚ and the year after. "Then by the time the fourth year comes the players are very familiar with you and they know what you want. “Stuart is a nice guy‚ and in my opinion he’s a good coach. He was employed for a reason - and that’s that they liked what he was doing for his clubs at Kaizer Chiefs and SuperSport United. Meanwhile, Igesund further added that the South African public also plays big a role in how the national team performs. “But I don’t think there’s a player attitude problem. I just think it’s the togetherness of all of us - all South Africans,” continued Igesund. “I think there are so many different agendas out there - this one talking badly about this one. “The clubs‚ coaches‚ players‚ administrators and the country must come together and pull towards one thing - and that is Bafana getting somewhere.